Dr. Banjo | FLEXIGRASS CD getting raves! 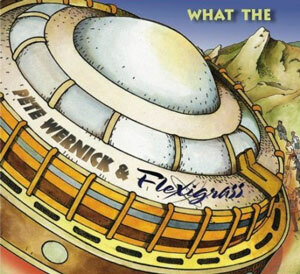 "I really enjoyed the Flexigrass CD a lot! It's a very rare album where the listener will never notice the wall of the genre. It's very natural, I think because of Joan. I believe she can handle any genre with her versatile voice." "What The is SO COOL! No, it's not bluegrass, but the banjo in Pete's hands fits in anywhere, and bluegrass keeps sneaking on in. Joan just absolutely commands the microphone... ya just GOTTA listen! Doctor Banjo and Nurse Joan? It's true; I've been in a funk over stupid stuff lately, WHAT THE was just the prescription I needed to snap me out of it!. Thanks!" "I really enjoy this new material. The instrumentation, material, and approach straddle a number of audiences." "What is it? Jazz? Bop? Dixieland? Bluegrass? A little bit of all plus a little swing and who knows what else. But it's good." "This CD was 'so hot' that when I turned on my CD player and the music started, smoke came out. This CD needs to be played several times in order to get the full impact of the great singing and the flawless instrumental work. I played the entire CD and received many requests for many songs to be played again. I also loaned it to a friend who has a jazz show and he had similar results. LOVED IT!!"